The current Mattersdorfer Rov is his son-in-law. There is also a son in Williamsburg. 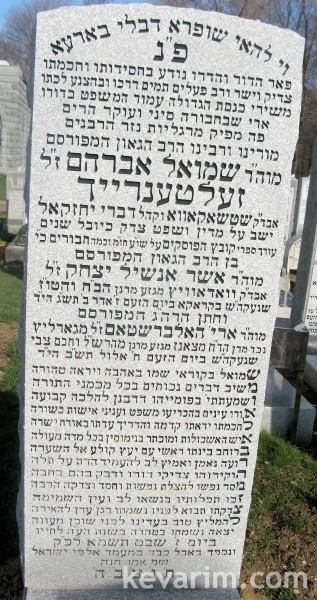 Was he related to Rebbe Yaakov Halberstam who was also known as Chakava Rebbe? As far as I know, they weren’t there at the same time. However, I can’t say for sure that it’s the same place. This one has a “shin” in front. It may be different places. It is indeed the same place, when Rebbe Yaakov left Tchakeve to EY and later the US, Rav Zeltenriech took over, then after WWII he settled in Williamsburgh with his house and Shul on Hooper St.
And BTW Baruch, the title should be Tchakeve Rav and not Rebbe, he was a great Posek and was one of the leading Rabonim in Din-Torahs at his time. As mentioned on his Matzeve, he was one of the Rabonim in Mareches Otzar Haposkim on Choshen Mishpat which to this date is a gigantic project in compelling Pesokim on Choshen Mishpat out of thousand of responsas (Shu”t), and serves as a great refrence tool on these studies. Why nitpick? In America 99% of the Rabbonim ended up with the title Rebbe. Nothing to do with kvitlech and tishen.